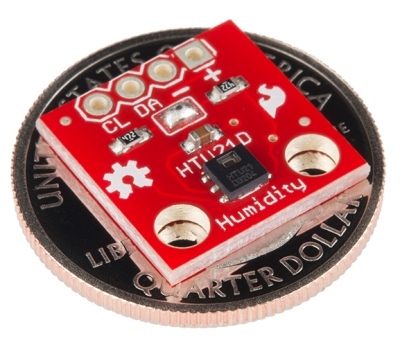 The HTU21D is a low-cost, easy to use, highly accurate, digital humidity sensor. All you need is two lines for I2C communication and you’ll have relative humidity readings such as “45.2%” or “23.1%” and very accurate temperature readings as a bonus! Operates from 0 to 100% humidity but this sensor isn’t recommended for harsh environments where it could come in contact with water (such as rain). This sensor is ideal for environmental sensing and data logging. Perfect for a weather station or humidor control system. It is a very good replacement for digital humidity sensors such as the SHT15, SHT21, SHT25, HIH-4030, HIH6130 and capacitive humidity sensors such as the HH10D. Wiring up the HTU21D humidity sensor is very easy! We recommend soldering four male headers to the breakout board and using the HTU21D in a breadboard. There are only four pins that need to be hooked up in order to start using this sensor in a project. One for VCC, one for GND, and two data lines for I2C communication. On an Arduino board connect the SDA pin on the breakout board to A4 and SCL to A5. If you have a newer Arduino, you can connect the SDA and SCL lines directly to the SDA and SCL lines broken out on the Arduino headers. This board runs at 3.3V. Be sure to power the board from the 3.3V pin! Because I2C is an open drain signal, there's no need to worry about level shifting the signal; the 3.3V signal will be adequate to communicate with the Arduino and the signal will never reach a dangerous level for the pins on the HTU21D. Note: This breakout board has built in 4.7k pull up resistors for I2C communications. If you're hooking up multiple I2C devices on the same bus, you may want to disable these resistors. To get your humidity sensor up and running, you will now install an example sketch and library. 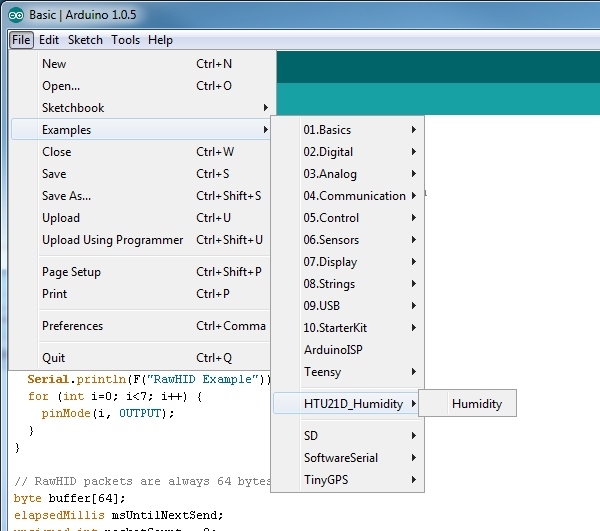 Once the library is installed, open the Arduino IDE, and expand the examples menu. You should see the HTU21D_Humidity submenu. 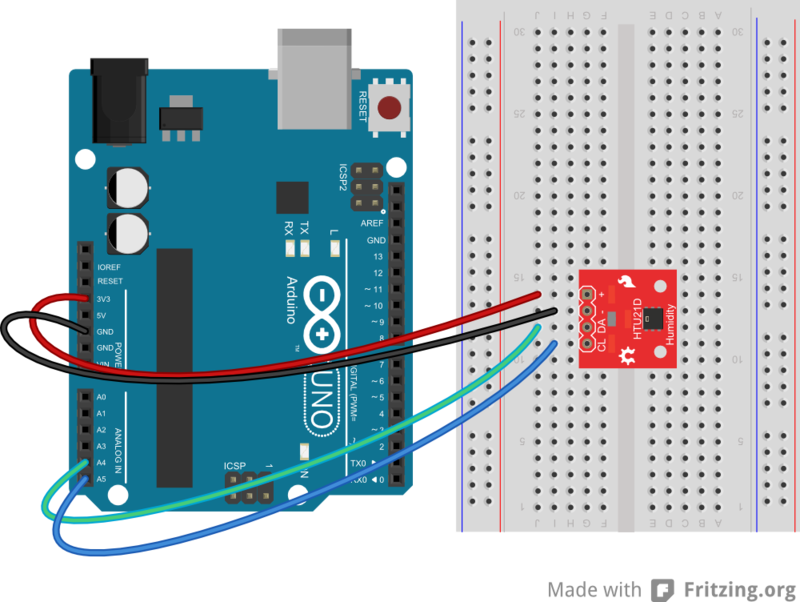 Load this example onto the Arduino, or copy from below. Open serial monitor at 9600 baud to see readings. Errors 998 if not sensor is detected. Error 999 if CRC is bad. Once your code is uploaded, open the serial terminal at 9600bps. You will see the current humidity and temperature in the room! myHumidity.setResolution(byte: 0b.76543210) sets the resolution of the readings. myHumidity.check_crc(message, check_value) verifies the 8-bit CRC generated by the sensor. myHumidity.read_user_register() returns the user register. Used to set resolution. 57.8 is an example of a valid reading. 0.0 to 100.0 for humidity and -40.0 to 125.0 for temperature. 998 indicates that I2C timed out (100ms max). Check your connections. 999 CRC was wrong. The HTU21D calculates an internal CRC and transmits it along with the temperature and humidity readings. It’s highly unlikely that you will ever see a bad CRC, but the library supports CRC checking. SetResolution() allows the user to change the humidity and temperature resolution. The vast majority of users do not need to change the resolution. By default the sensor will be in its highest resolution settings. This function is useful if you need to decrease the amount of time between readings or to save power. See page 12 of the datasheet. As an example, to change the resolution to 11 bit RH and 11 bit temperature, you would call myHumidity.SetResolution(0b10000001); to set bit 7 and bit 0.
check_crc() inputs the message and check_value from the HTU21D and then does a 8-bit polynomial CRC to verify that the message the sensor sent was valid. It’s extremely rare that you will see a bad CRC but if you’re looking into how to decipher a 8-bit CRC, this is a good example. The HTU21D uses the same CRC as 1-wire products. There are two 4.7k resistors on the breakout board that pull-up the SDA and SCL lines. If you've got other devices on the I2C bus you may need to disable the on-board resistors. To do this you need to clear the solder jumper on the board. This will disconnect the resistors from VCC and from the I2C bus.